Need to get rid of this? Don't want to haul it away or pay someone else to do it? Then burn it in a CharCone. With a smokless fire. Anytime of year. Yes! 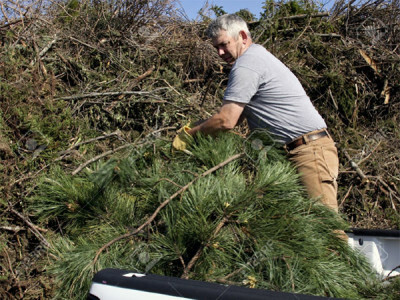 You can turn your brush pile into high-quality natural lump charcoal (not cheap, artificial briquettes) that can sell for up to $1/lb. This is what the CharCone was designed to do. 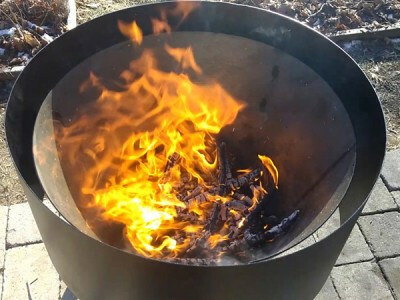 By prepping the wood correctly and using a simple technique of building and maintaining the fire, you can create a coneful of charcoal (20-30 lbs.) instead of a small pile of ashes. You can use the charcoal for your next barbecue or process it in a more earth-friendly manner. 2. Add only one layer at a time. The flame stays on top, the wood below cooks but doesn't "burn"
3. Two hours later: 10 -15 gallons of natural lump charcoal. Oh, and, gives you some delicious grilled or roasted food! You can use a stick from the brush pile and roast a marshmallow or hot dog or you can get fancy and use any of the accessories we recommended or sell. It’s not so easy cooking with the CharCone – you will be always busy adding wood and the fire gets very hot – but if you can manage, it makes the cooking all the more fun. 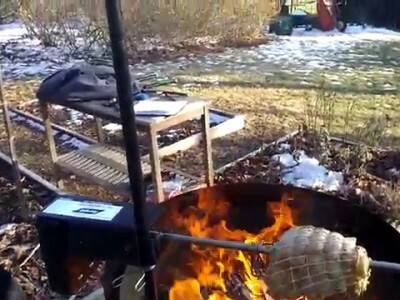 Check out the videos and pictures below for some suggestions on how to cook with the CharCone. Hot dogs or marsmallows on stick work just fine. 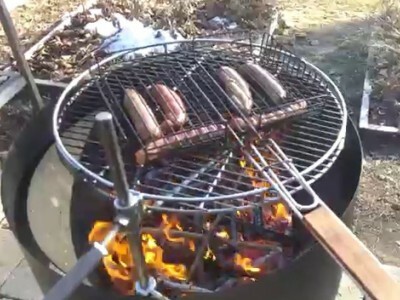 Optional swing-out grill makes things easy and safe. Get fancy with an adjustable rotisserie attachment. Can you use the CharCone to burn your brush (and other waste wood debris), cook your dinner, make some charcoal, and SAVE THE PLANET? Charcoal, if made right, is almost pure carbon (C). The wood you burned came from trees or other forms of woody plant. The trees sucked some CO2 (carbon dioxide – the greenhouse gas that is causing global warming) out of the air (a good thing), broke off the O2 (oxygen) and gave it to us to breathe. 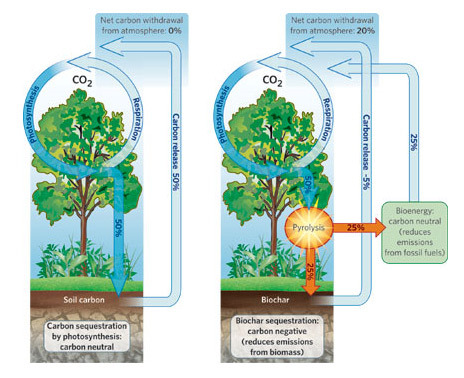 It took the C (carbon) that was left over and stored it (well 50% of it anyway) in its roots, trunk, leaves, etc. 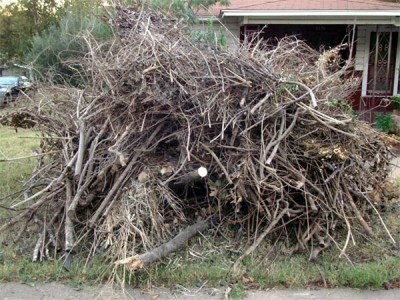 There it remained, sequestered (offline), until it ended up in your brush pile. When you burn it, 50% of that carbon combines with the oxygen in the air and reforms into CO2 and goes back up into the atmosphere (a bad thing). However, THE SAME THING WILL HAPPEN EVENTUALLY WHEN THE WOOD ROTS. It may take a couple or ten years but it then ALL of the sequestered carbon in your brush will degrade to CO2 and return to the atmosphere. 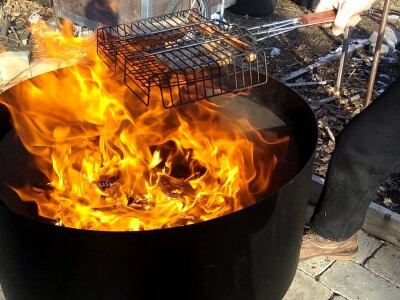 So here’s the thing: if we make charcoal while we burn, we can retain and stabilize (it will never re-form into CO2) up to 50% of the original carbon in the wood. That represents over 20% of the original CO2 that the tree had sucked out of the air. If we then bury it (or in some other way permanently sequester it), we in effect “uncycle” that carbon from the atmosphere. Theoretically, if we do this on a large enough scale (100,000 CharCones? ), then we could make a significant dent in the excess CO2 that is responsible for climate change. For every 10 gallons of charcoal you make (about a burn’s worth) you remove from the atmosphere 60 lbs. of CO2e – the equivalent of replacing one 75 watt incandescent bulb with a 19 watt CFL. So, as far as charcoal goes – BURY IT, DON’T BURN IT! Oh, and by the way, when you make charcoal with the intention of sequestering it, prepare it properly and then put it in soil, it’s then called BIOCHAR. 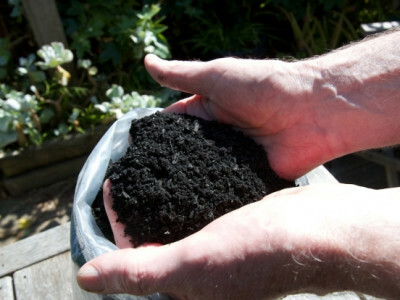 Adding biochar to your garden or potting soil will not only fully sequester it, but make will your plants grow much better by creating a stronger, more resilient and absorbent soil. 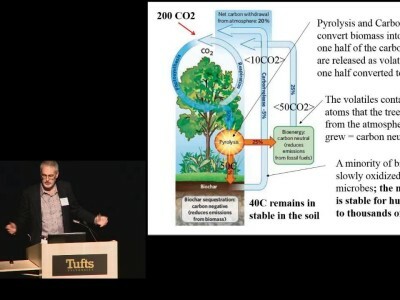 Click the button below to see Dr. Hugh McLaughlin's excellent presentation of biochar and the carbon cycle. Also known as "terra preta", biochar mixed with soil was the secret to a lost Amazonian civilization. Click thebutton for the story. Make your own test. 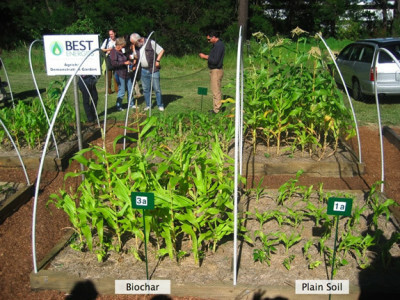 All you need is some biochar and a small garden.